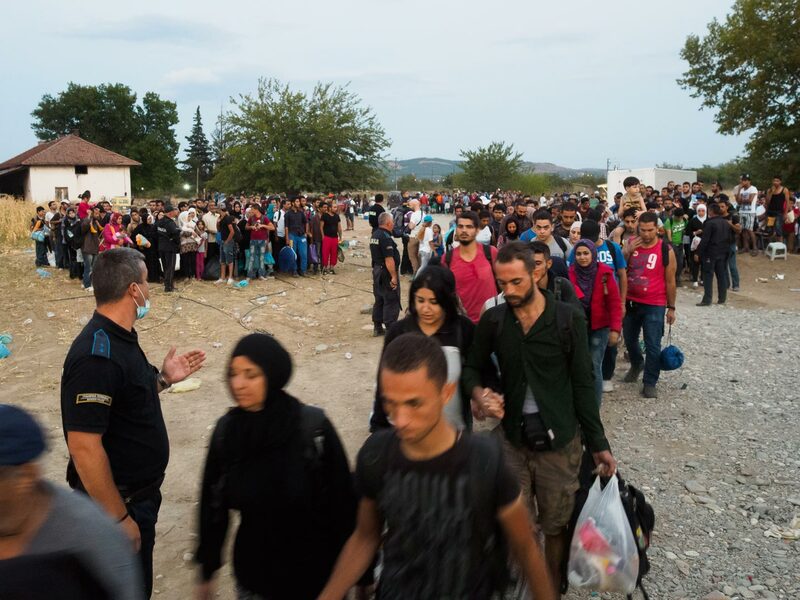 Macedonia, Serbia, Hungary, and Austria—As nightfall descends just outside Gevgelija, Macedonia, more than a thousand people begin lining up in rows for the evening train headed north for the border with Serbia. Just two months ago, this town and the area around it, on the main border with Greece, was a scene of chaos, as riot police fired tear gas and rubber bullets at refugees fleeing persecution and conflict in the Middle East, Africa, and Central Asia to prevent them from entering Macedonia, one leg of their long, perilous journey to the promised land of the European Union. A lot has happened since those scenes of bedlam. This small Balkan country—which has a history of hostility toward its own Muslim-Albanian minority and toward refugees from the Kosovo war of the late 1990s—has become one of the least obstructive places for refugees to pass through. 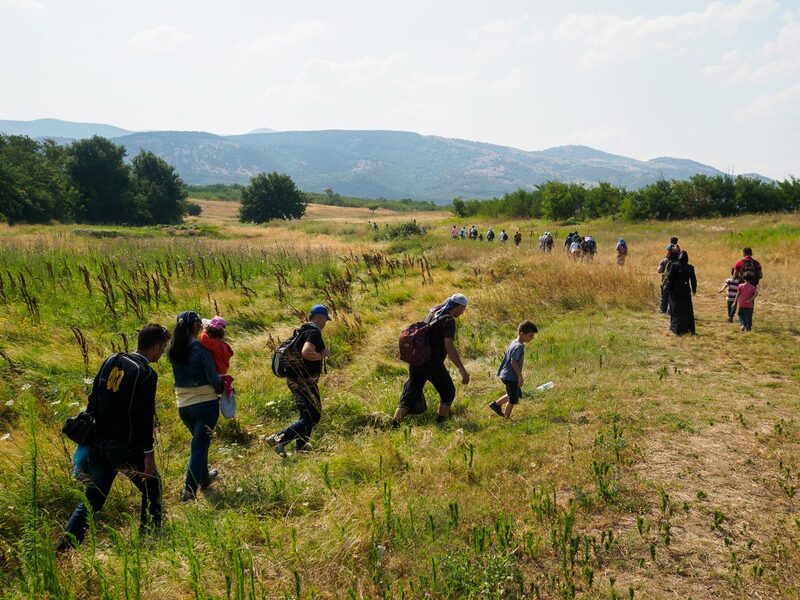 Instead of enforcing a wall of resistance, police now direct people to a newly created camp outside Gevgelija administered by the government and the United Nations High Commissioner for Refugees (UNHCR). Tall white tents, much like those in the huge refugee camps in countries bordering Syria, operate as a registration and temporary rest center. Often within hours of receiving food and water and registering (though many don’t), people board overcrowded trains and buses and head for the next border. A long, rickety series of 1980s-era Yugoslav cars, recently spray-painted with graffiti, pulls into the makeshift stop and people clamor toward the walkway. Members of Macedonia’s paramilitary special-forces unit attempt to control those desperate to secure a seat, barking orders in broken English at old and young alike to sit on the ground and wait. “Honestly, many of us wish we could go with them to Germany,” says one cop in khakis, equipped with gun and baton. Declining to give his name, he complains about being unable to support himself on his yearly $5,000 salary. At 27, he, like many in his unit, says he has no prospects in Macedonia. He sounds almost envious of the refugees he’s guarding, showing little sympathy for them or understanding of the devastation they are fleeing. Groups of 30 hurriedly shuffle up the gravel bank under floodlights, as rail conductors bellow out the demand for ten euros per person. The refugees scramble to find seating after the daylong journey from Athens on bus, rail, and foot, with many ending up crammed into carriage corridors. The train is stiflingly hot as it jolts out of the camp. Mothers hold their kids up to open windows in a bid to keep them cool. Refugees arriving in a camp in Gevgelija, Macedonia, near the Greek border. At the end of one corridor, four men from Baghdad attempt to stretch out on the floor and smoke next to the car’s open door. Both Sunni and Shia, most were students before they fled Iraq’s growing sectarian violence. Ahmed (they all decline to give their full names out of fear for their family’s security) is the oldest in the group. A balding man in his late 40s with a trim white mustache, he was a high-school teacher in Iraq. The rest of the guys treat him like a father figure, passing him cigarettes and cups of soda. “We are Iraq,” says Ali, introducing me to his traveling companions as the car jerks sharply from side to side. Last month, the 24-year-old management student from Baghdad fled to Turkey. He talks about how his brother was a translator for American soldiers during the occupation. Since then, his family has faced increasing threats, eventually forcing them to close the cafe they owned. “It has been very dangerous for my family,” says Ali somberly. His brother and the rest of his relatives, still in Iraq, continue to hope for visas to immigrate to the United States, but they have been waiting for years. In that time, bombings from a conflict sparked by the US invasion have risen, so Ali gambled not only on leaving but on taking the dangerous boat crossing from Turkey to Greece. Now he sees his future in Scandinavia. He wants to go to Finland, where he has friends, but he believes he will have more luck in Sweden, which alongside Germany has taken in the largest number of refugees. “It’s a long journey, but I hope to find justice in Europe,” Ali says with optimism, as the Macedonian countryside flies by. On Macedonia’s frontier with Serbia people disembark, getting water and food at a UNHCR and Red Cross camp as they prepare for yet another arduous hike, this one 10-15 kilometers across fields and along the shoulders of highways. The biggest hazard for the 5,000 or so people who now cross daily is kidnapping and extortion by the Albanian mob operating around the Serbian border town of Presevo. The mafia first developed a strong presence in the area when it established smuggling routes to undermine the 1998 UN arms embargo and economic sanctions against Serbia and Montenegro, imposed before the Kosovo war. While most refugees rely on smart phones rather than human traffickers on this part of the journey, they follow routes developed to run banned goods across the border. Hundreds of people have been kidnapped and held for ransom by gangsters, and robberies of asylum seekers are common. At the government- and UNHCR-funded camp in the center of town, people crowd the entrance as police wearing hospital masks and gloves take their information and fingerprints. After processing, they rest on the grass or in tents allotted for women and children while waiting to catch buses to Belgrade. According to the camp director, Uros Jovanovic, there is capacity for 2,000, but the camp is often pushed beyond its limits. Standing with her husband outside a tent, 26-year-old Dozkee (she declines to give her full name) describes fleeing ISIS’s assault on the Syrian Kurdish city of Kobani in September 2014 for the refugee camps of Iraqi Kurdistan. She is eight months pregnant, and three weeks before arriving in Serbia, she left Iraq with her husband for Turkey, followed by the hazardous voyage across the Mediterranean. Refugee tent cities, wedged between the drab 1970s-era apartment blocks, surround the bus station in Bukarevac, eight kilometers from Presevo. On a patch of grass next to the station, members of the Syrian rock band Khebez Dawle—an appropriation of the Arabic name for Syria’s nationally subsidized bread—sprawl on sleeping bags, one of them strumming an acoustic guitar they picked up in Athens. These idealists of the early days of the revolution were at the center of Beirut’s indie music scene until they departed for Europe in August after finishing their first album, which lead singer Anas Maghrebi describes as an eyewitness account of the Syrian war. Formed out of the small clandestine rock scene in Damascus, Khebez Dawle found a stage in Beirut after band members dodged conscription into Syrian dictator Bashar al-Assad’s army and fled the increasingly hopeless civil war. 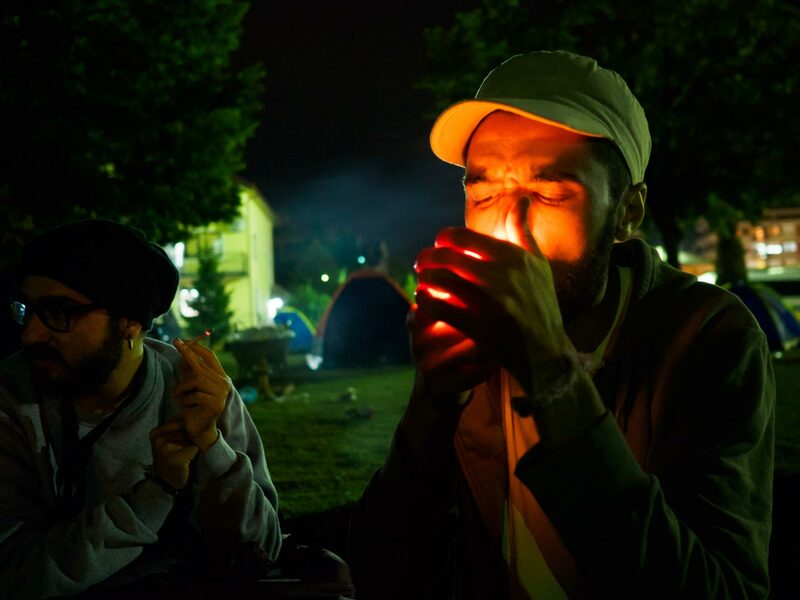 Maghrebi describes life in Beirut as “the hardest rehearsal for Europe.” While the band had the support of local artists and a growing following, he says that the restrictions and the precariousness of not having legal status in Lebanon stunted their possibilities. Anas Maghrebi, lead singer of the band Khebez Dawle. “You are always a Syrian in Beirut,” he says, reaching for the acoustic guitar that bassist Mohammad Bazz is strumming. “Syrians in Beirut don’t have many chances. It’s a station [before you can move on],” he adds, plucking at the strings. The band sold all their instruments and equipment to be able to afford the trip and pay off the necessary traffickers. Even so, the guitarist, Bashar Darwish, is still stuck in Lebanon, unable to get appropriate identification even to leave for Turkey. Still, Maghrebi rejects the refugee victim’s narrative. He wants to be recognized as a protagonist in his own struggle. When the band’s rubber dinghy hit shore on the Greek island of Lesbos, Maghrebi says, the first thing he did was hand out free copies of the band’s new self-titled album to surprised sunbathing tourists. Plugging his smart phone into a set of portable speakers, the lanky, bushy-bearded vocalist and guitarist puts on Radiohead’s OK Computer album before retreating from the nighttime breeze into his black sleeping bag. It’s three days before Hungary closes its borders to refugees, and while waiting for the bus to Belgrade, the band makes a snap decision to avoid that Central European country and instead travel through Croatia toward Austria, their destination of choice. Two weeks later, they play their first European show in Zagreb to several hundred new fans. Maghrebi describes his band’s clandestine migration mixed with a refugee rock tour as a journey of necessity to tell the Syrian story through music. Traveling through Serbia to Hungary. Over the summer, the park next to Belgrade’s central bus station overflowed with people, becoming an urban campground for asylum seekers. Rows of tents first purchased shortly after they arrived in Greece sit under laundry lines strung between trees next to a busy tram route. People with enough money cram into rooms at the few hostels that will rent to refugees. The surrounding cafes and bars are filled with people planning the next stage of their journey into the EU zone. Refugees huddle in negotiations with people smugglers on side streets, while others scramble for bus tickets to the border. 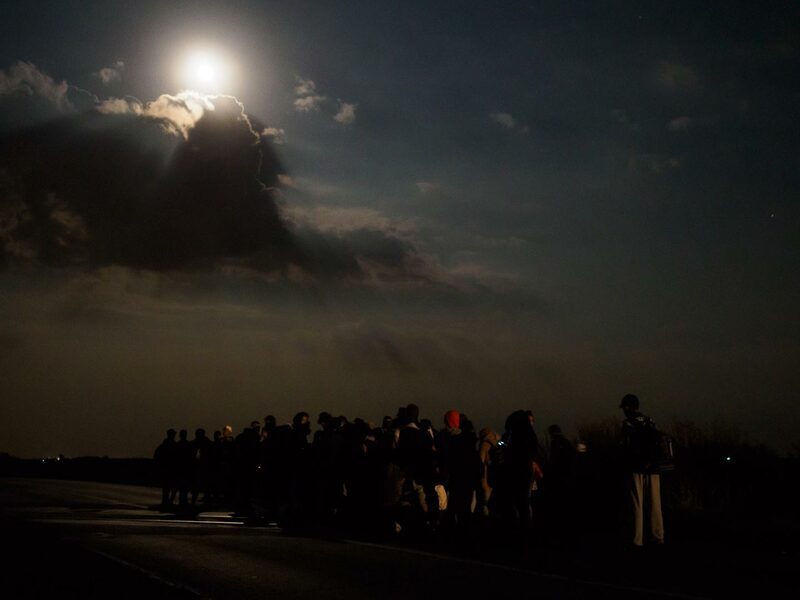 After dark, groups of cars and vans periodically pull up and, for a few hundred euros, whisk dozens of people at a time toward the Hungarian border. Throughout the summer, crossing into Hungary was seen as the last hurdle before asylum seekers were able to reach their final destination. 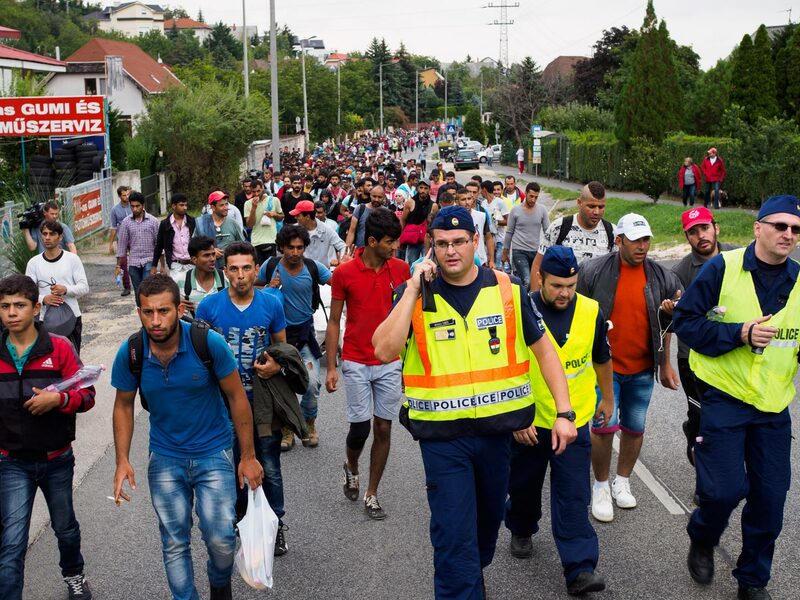 However, the increasing government restrictions and the crackdown by police on those crossing from Serbia pushed more people to rely on human traffickers as they coped with increasing roundups and new dead-ends. That’s the dilemma that Ahmed, a 24-year-old chemical engineering student from Damascus, grapples with as he hops off one of the buses at the Serbian transit camp near the border town of Horgos. People are rushing to get into Hungary a week ahead of the looming border closure and before new laws go into effect making it an offense punishable by imprisonment to enter the country illegally. For over an hour, an Afghan mother wanders the dark fields, searching for her 1-year-old baby. Bristling at the prospect of landing in an overcrowded camp guarded by riot police while waiting to be registered, Ahmed decides to be trafficked through Hungary to Austria. “The traffickers told us to go to the gas station on the side of the highway [in the Hungarian border town of Röszke],” he says, describing the route he takes after following the nearby train tracks into Hungary, all the while trying to avoid the police. “We [are supposed to] take a 200-euro ‘taxi’ to Budapest. Then they told us to go to a hotel behind Keleti train station and we will be taken to the Vienna airport.” In total, he will pay 1,000 euros to be crammed into the back of a truck traveling an underground highway that has already clamed the lives of 71 refugees who suffocated in the back of a truck. The gas station that Ahmed mentions is a booming underground transit hub at night. Bouncer-like traffickers lean against their vans as groups of people—young men and families alike—emerge from the bushes and are hustled toward the vans. The traffickers are organized along ethnic lines. White and Roma drivers attempt to undermine each other’s business, squabbling over people to exploit. They yell their prices in broken English at nervous asylum seekers, who have spent hours evading police. They are quickly spirited away, paying 200-300 euros per person. Five hundred meters away are the train tracks, which most people used to guide them across the border before it closed. Here, the police chase down and detain those who have just entered Hungary. Helicopters with floodlights circle overhead, while police vans drive up and down the roads near the border. 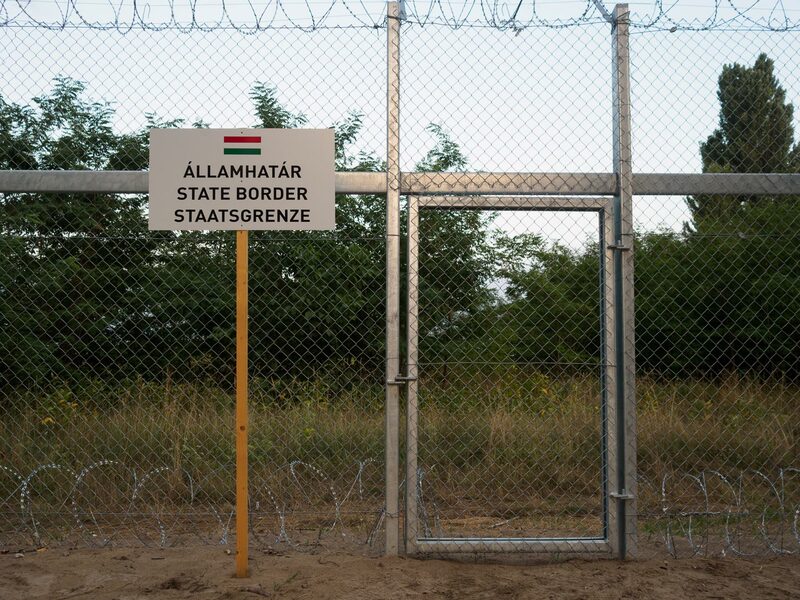 The fence Hungary has built along its border with Serbia. The recently erected razor-wire fence separating Serbia and Hungary is littered with tatters of cloth, evidence of the rough road to freedom. Groups of people can be seen using the cover of darkness to hurriedly rush through border communities toward the nearby city of Szeged. This is one of the tensest parts of the journey, and many, having heard stories of mistreatment, are terrified at the prospect of being detained by the Hungarian police. They also worry that registering in Hungary might block them from settling in their final destination. While Germany agreed to take in large numbers of Syrians, the same openness doesn’t apply to Afghans and many others fleeing violence and persecution. After hours of watching refugees being exploited by human traffickers while the police watch in the distance, I see the same officers traipsing through fields searching for people who have crossed the border. A patrol helicopter flashes its searchlights on a group who panic and scatter, separating an Afghan mother from her 1-year-old child. For over an hour she wanders through the dark fields, crying out her baby’s name. Police follow her with flashlights, only making the situation worse as people run farther into the forest and fields. Eventually, the helicopter returns to join the search. Balazs Szalal, a local refugee solidarity activist, splits off from the police to ask refugees if they have seen the child, even as he tries not to give away their location to police. The mother’s cries echo in the distance. After an hour, the police flashlights go dark, the helicopter disappears, and the mother’s cries can no longer be heard. Szalal says he has been unable to get any information on whether the child was found or not. The police corral asylum seekers in an open field next to the train tracks before busing them off to the processing center in Röszke. This town is also the site of emerging collective defiance against the tightening border restrictions. Groups of refugees suddenly break out of the enclosure, bursting en masse past bewildered police before disappearing into the nearby fields. It is one of the early acts of resistance against border restrictions. Budapest’s Keleti station is the next stop for those who don’t want to use traffickers and have avoided the net of state security, but since Hungary has blocked refugees from boarding trains to Austria and Germany, people often find themselves stranded again. Majd, 22, describes fleeing a district in Syria’s Idlib Province controlled by the Al Qaeda–affiliated Nusra Front; he’d faced a death sentence for blasphemy. He boarded a train in Szeged with his brother, sister-in-law, and their child. He scanned the train, worried that police will enter the car, pull his family off, and send them to a processing camp. With each station, their fear of being caught grew. “After all this, we have almost made it,” he says, believing that after arrival in Budapest they will easily be able to take a train to Germany. However, as they disembark they find out the government has blocked the train. Like so many others trying to get through Hungary, the family finds itself living in the tent city outside Keleti. Disillusionment and frustration lead to an explosion of refugee protests at the station, attracting global attention. “This is in joint consultation with the Austrians and Germans,” says Hungarian government spokesperson Zoltan Kovacs. Then on September 3, the crisis changed. Hungarian police worked with local train-station staff to deceive asylum seekers into boarding trains at Keleti for detention centers outside the city. At a station where Hungarian police and rail employees collaborated with the Nazis to deport Jews to death camps in 1944, these contemporary victims of persecution are often told nothing at all. Some of the trains pulling into the station have German flags on the front, deliberately implying they will be taking refugees to Germany. 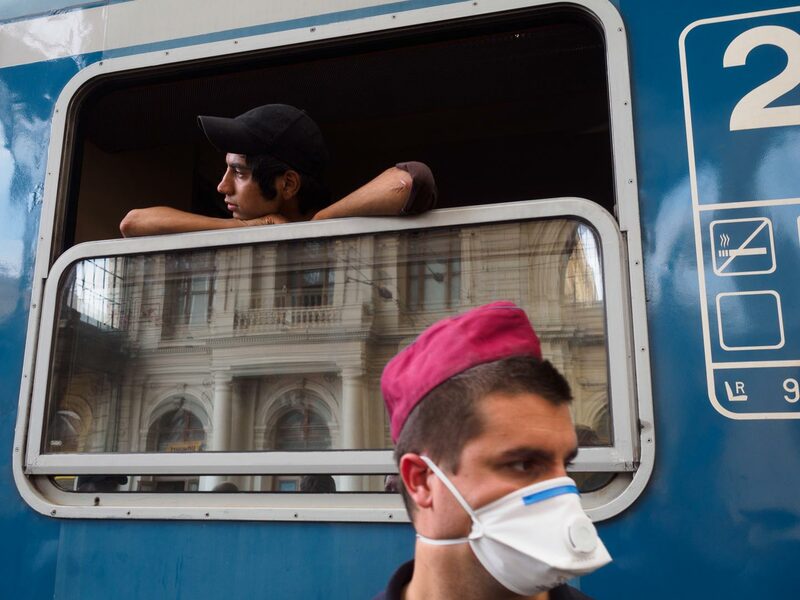 Hungarian police told refugees this train would take them to Germany. Instead, it took them to a camp within Hungary. “No one will tell us where the trains are going—no police, no train conductors,” says Eyad. The 43-year-old from Damascus declines to give his name out of fear the Assad regime will carry out reprisals against his family in Syria. This mass detention was the final straw for many. The next day, people desperate to begin their new lives take to the highways in mass marches toward the Austrian border. “Today we said ‘enough’ and decided to march,” says 22-year-old Massan al-Hassan from Baghdad, as he walks across the Austrian border in the pouring rain. Stranded at Keleti for four days, he describes how people at the station decided to march after hearing that those who were manipulated into boarding trains to a camp in Bicske, outside Budapest, took to the streets. In the face of these marches, other EU countries, including Austria and Germany, openly condemned Hungary’s handling of the situation, forcing a change in policy. After caging and detaining refugees, all of a sudden the police were tasked with protecting the marchers on the highways, while the government was compelled to bus thousands to Austria. Walking from Budapest toward the border with Austria. Although he hurled angry rebukes at Austria and Germany, Kovacs acknowledged there was little the government could do in the face of such coordinated action. “There is no change in policy. There was a change in circumstances, as hundreds and then thousands began walking on the motorway,” he said in frustration. A week later Hungary slammed shut its border with Serbia. Clashes between refugees and Hungarian riot police erupted, after which the mass migration route through Croatia emerged. However, even after that display of force, Hungary’s fortress approach started showing cracks, and by late September it was again allowing buses of refugees through the country as the number of people stranded in Croatia steadily grew. Europe continues to fight over how many refugees each country will take, even as it looks for ways to close its borders to succeeding waves of people fleeing war and persecution. German Chancellor Angela Merkel is now spearheading an EU proposal to give Turkey 3 billion euros to help it cope with the 2 million Syrian refugees Turkey is now hosting—and as an inducement to prevent more from fleeing to Europe. The deal would include designation of Turkey as a “safe” country—a status that would prevent Turks, including its besieged Kurdish population, from seeking political asylum at a time when Ankara is inflicting major human rights violations as it expands hostilities against Kurdish PKK guerrillas. An additional sweetener could include eased EU visa access for Turkish citizens, but many xenophobic EU members have for years balked at giving easier entry to citizens of this predominantly Muslim country on its border. Hungary’s response to the latest diplomacy was to close its border with Croatia, just as it did with Serbia last month. To get around this latest blockade, stranded refugees began to travel through Slovenia on their way to Austria and Germany. Unlike previous spats between Merkel and Hungarian Prime Minister Viktor Orbán’s right-wing government, the latest one is about their differing approaches on how to tighten borders, not the overall direction of EU immigration policy. Germany has now become a leader in the growing European movement to shut out asylum seekers. As EU members buttress borders and issue new legal restrictions, refugees are realizing that circumventing these constraints requires either taking collective action or putting their fate in the hands of human traffickers. Refugees are showing a determination that Europe’s obstacles have been unable to deter.